Spaghetti napolitan, also known as spaghetti naporitan, is a Japanese style pasta dish made with a sauce that is tomato ketchup based. This particular style of Japanese pasta is considered "yoshoku" cuisine, or western cuisine with unique Japanese influences. Another term for Japanese style pasta is known as "wafu pasta". The recipe for spaghetti napolitan is unique in that sliced onions and green bell peppers are sauteed with either ham (lunch meat style) or bacon and then tossed with spaghetti noodles and tomato ketchup. Finally, it's simply seasoned with salt and black pepper and served with hot sauce for those that enjoy a bit of spice. Spaghetti napolitan was created by Head Chef Shigetada Irie at the New Grand Hotel in Yokohama, Japan shortly after the end of World War II. It was named napolitan, or napoli, after Naples, Italy. It is believed that this recipe was inspired by the spaghetti and tomato sauce dish that the U.S. troops were eating overseas. 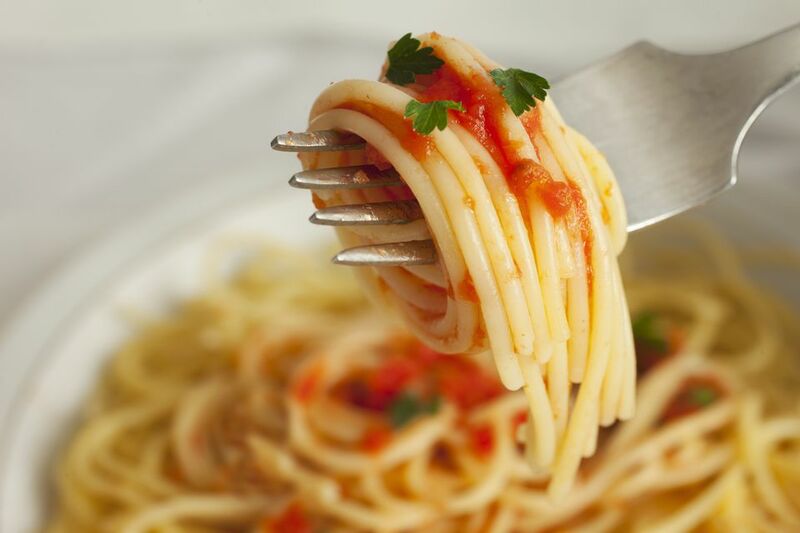 Interestingly, in order to make Japanese style spaghetti napolitan properly, tomato ketchup must be used as the base for the sauce, and not tomato sauce or puree. This dish is quite easy to prepare and can be made in under 30 minutes. It is often served at home, but it is also a standard "wafu pasta" menu item at cafes in Japan. Put about 8 cups of water in a large pot and add 1/2 tablespoon of salt. Bring to a boil on high heat and cook spaghetti according to package directions until al dente, about 7 minutes. Note: the pasta will be cooked once more with the sauce. Drain the noodles well and set aside. Meanwhile, heat vegetable oil in a large skillet and stir-fry onion, bell pepper, and sausage on medium heat until softened. Season with salt and pepper, to taste. Add drained spaghetti in the skillet with the vegetables and sausage and toss gently. Add ketchup and stir-fry the spaghetti, coating all of the ingredients. Mix butter in with the pasta, add salt and pepper, if necessary, to taste. Remove from heat. Optionally, garnish with chopped parsley and serve with hot sauce.